Between the upcoming release of Wall-e and the movie Iron Man, I have a feeling there is going to be a big demand for robots this summer! From Lego to Transformers, kids of all ages (especially boys) will have fun using their imaginations to engineer their own robots. We have created a quick printable maze to get them started! Just get the robot from the starting line to his shop to get a tune up. 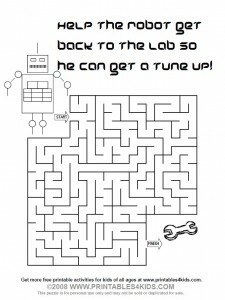 Click on the image above to view and print the Robot Maze full size or download the Robot Maze as a PDF file. Our robot maze would make a great activity for a robot inspired birthday party theme. We just found these super cute Robots party supplies – where were these when my son was about 5?? Perfect for little boys with big imaginations!